MAKE SPACE FOR INGENUITY: THE MINI LIVING “DO DISTURB” INSTALLATION AT SALONE DEL MOBILE 2016. “Creative use of space” has always been at the core of the MINI brand. 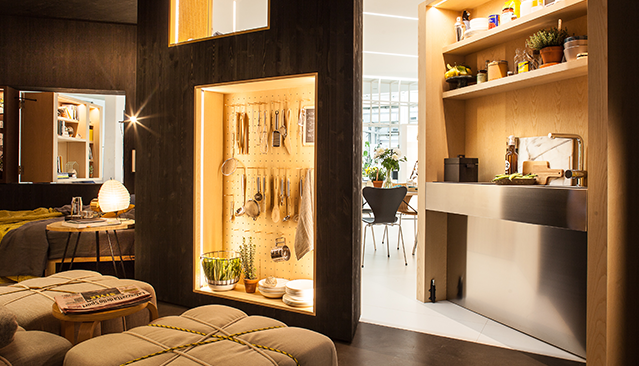 Now, with the “MINI LIVING” installation, MINI demonstrated how this principle can also be applied to urban living spaces. This unique installation was made available for visitors to experience at Milan, Italy during the Salone del Mobile. MINI LIVING turns “sharing” into an adventure in its own right. Occupants who make their individual living space and functions sharable with the wider community can quite literally “open up” to interaction and experiences that would not be possible in a conventional private space. “With the MINI LIVING installation, we’re looking to be part of a debate about future forms of shared living. In the city, more and more people have to share space which is increasingly scarce and finite. We see a lot of potential in this situation for making urban living more communal and reciprocal. The installation combines both sides of the equation within a compact footprint – it is both a haven of privacy and also an interface to the wider community,” says MINI LIVING project manager Oke Hauser.